This month, we include an article by Gully Wells that was published in last weekend’s New York Times T Magazine. The article, which includes an interview with Hugo Nathan, questions whether connoisseurship still has a role to play within the current art market. We feel that it does, but this article certainly raises some interesting points. We hope that you find it interesting. Wells, G. (2015, October 13). 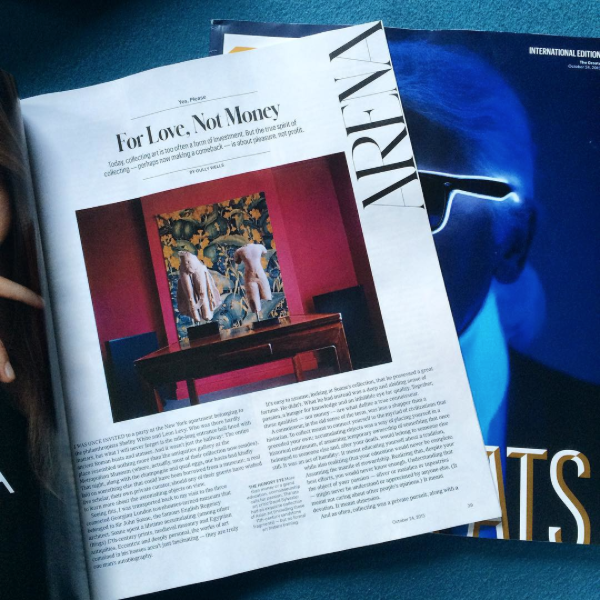 Collecting Art for Love, Not Money. The New York Time Style Magazone, pp. 39-40. “I was once invited to a party at the New York apartment belonging to the philanthropists Shelby White and Leon Levy. Who was there hardly matters, but what I will never forget is the mile-long entrance hall lined with ancient Roman busts and statues. And it wasn’t just the hallway: The entire place resembled nothing more than the antiquities gallery at the Metropolitan Museum (where, actually, most of their collection now resides). That night, along with the champagne and quail eggs, our hosts had kindly laid on something else that could have been borrowed from a museum: a real live scholar, their own private curator, should any of their guests have wished to learn more about the astonishing objects on view. “Seeing this, I was transported back to my visit to the three connected Georgian London townhouses-turned- museum that belonged to Sir John Soane, the famous English Regency architect. Soane spent a lifetime accumulating (among other things) 17th-century prints, medieval masonry and Egyptian antiquities. Eccentric and deeply personal, the works of art contained in his houses aren’t just fascinating — they are truly one man’s autobiography. “It’s easy to assume, looking at Soane’s collection, that he possessed a great fortune. He didn’t. What he had instead was a deep and abiding sense of passion, a hunger for knowledge and an infallible eye for quality. Together, these qualities — not money — are what define a true connoisseur. “A connoisseur, in the old sense of the term, was less a shopper than a historian. To collect meant to connect yourself to the myriad of civilizations that preceded your own; accumulating objects was a way of placing yourself in a historical continuum, of assuming temporary ownership of something that once belonged to someone else and, after your death, would belong to someone else still. It was an act of humility: It meant educating yourself about a tradition, while also realizing that your education would never be complete. Assuming the mantle of stewardship. Realizing that, despite your best efforts, you would never know enough. Understanding that the object of your passion — silver or maiolica or tapestries — might never be understood or appreciated by anyone else. (It meant not caring about other people’s opinions.) It meant devotion. It meant obsession. “And as often, collecting was a private pursuit, along with a lifelong one. You spent 20 or 30 years, more, searching for and buying — and, let’s not forget, maintaining — art or objets. And those art or objets weren’t merely for display, necessarily: Think of Yves Saint Laurent and Pierre Bergé’s houses in Normandy, in Paris, in Tangier, in Marrakesh. All were filled with exquisite pieces — Old Master paintings, textiles and one of the finest assemblages of Art Deco furniture in the world. None of these, however, were acquired to dazzle — they were acquired purely for the satisfaction that they brought their owners. Whatever the object of your passion, it demanded that you become a scholar, a devotee of your things. Collecting might have been pleasurable, but its pleasures often resembled something closer to work. The joy of connoisseurship was its privacy and, as importantly, its rigor — it may have required you to become a scholar, but that was also its benefit; anyone, from the expensively and extensively educated to the less-so, could immerse themselves in history. Anyone could find themselves part of a long artistic tradition. All you needed was time, a little money — and a sense of dedication. “TODAY, THAT DEFINITION of connoisseurship — both its demands and delights — hasn’t changed. What has changed is that we no longer collect as we once did. Today — blame a pace of life sped up by technology; blame a money-obsessed culture — people buy art and objets for very different reasons. “‘‘At first sight there appears to have been a great renaissance of the collecting urge, both public and private, since the Second World War,’’ says Eugene Victor Thaw, the scholar, collector and fine-art dealer, who has accumulated what is universally recognized as one of the world’s finest collections of Old Master drawings (all destined to be given to the Morgan Library & Museum). ‘‘However, if we inspect this seemingly civilized phenomenon more closely, we will see that there has actually been a gradual shift of emphasis away from collecting art toward the very different activity of investing in it’’ — an impulse, needless to say, that would have been incomprehensible to people like Soane, or Isabella Stewart Gardner, or J.P. Morgan, or Albert Barnes. “‘‘We used to see people collecting over a lifetime with a depth of different interests and connoisseurship that one rarely, if ever, sees now,’’ adds David Roche, a senior consultant in the American Indian art department at Sotheby’s. ‘‘Today people collect in a much more limited way, far more quickly, and tend to concentrate primarily on contemporary art.’’ Now, few have the patience, the humility, for collecting slowly: The goal instead is instant gratification, and instant bragging rights. The aim is to get something of identifiable worth before anyone else does, and mount it quickly on the wall, and show it off as fast as possible. It is art as commodity, but it is also time as commodity. Owning and displaying contemporary art — well-known contemporary art, one might clarify, the more recognizably expensive, the better — has become a shorthand for who we want to seem to be, an announcement of our place in the social order. Today, one owns art to inspire emotions — shock, awe, envy — in others, to remind one’s guests that you have something they don’t; it is, unlike connoisseurship, an essentially public act, a performance. “Yet that doesn’t mean connoisseurship as we once understood it is dead — it’s just gone underground, somewhat. And the tide possibly seems to be turning; a reminder that as sterling an investment as contemporary art might appear, it is — like all investments — not without risk. Why not return, then, to the exhausting and exhilarating pleasures of collecting as it once was? “For evidence, look at Norman Rosenthal, a former exhibitions secretary at the Royal Academy of Arts in London, whose new Collections section at London’s Frieze Masters fair featured eight dealers representing works in fields recently eclipsed by the tsunami of contemporary art: Japanese netsuke, ancient Egyptian wood sculpture and Italian Renaissance ceramics among them. 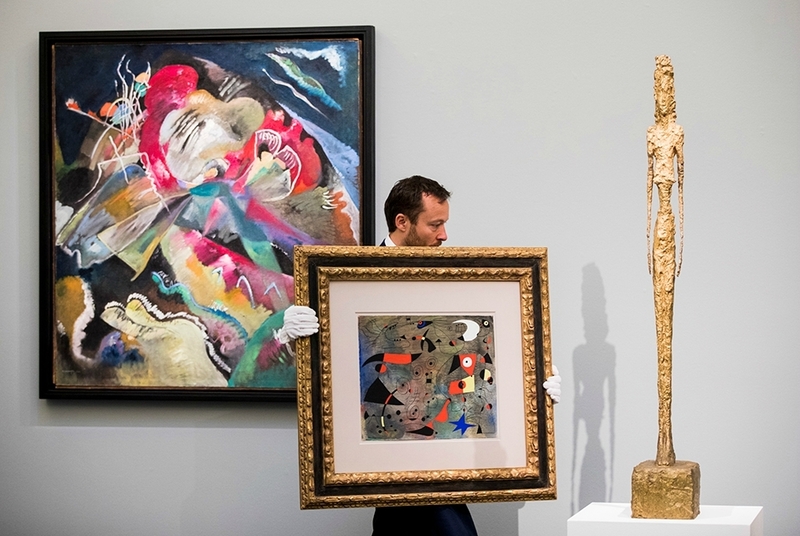 There’s also the recent two-week showcase of pieces — ranging from antiquities to 19th-century objets — mounted in New York by a group of four of Europe’s most distinguished antiquities dealers, all of whom are frustrated by the feverish climate of the contemporary art market. 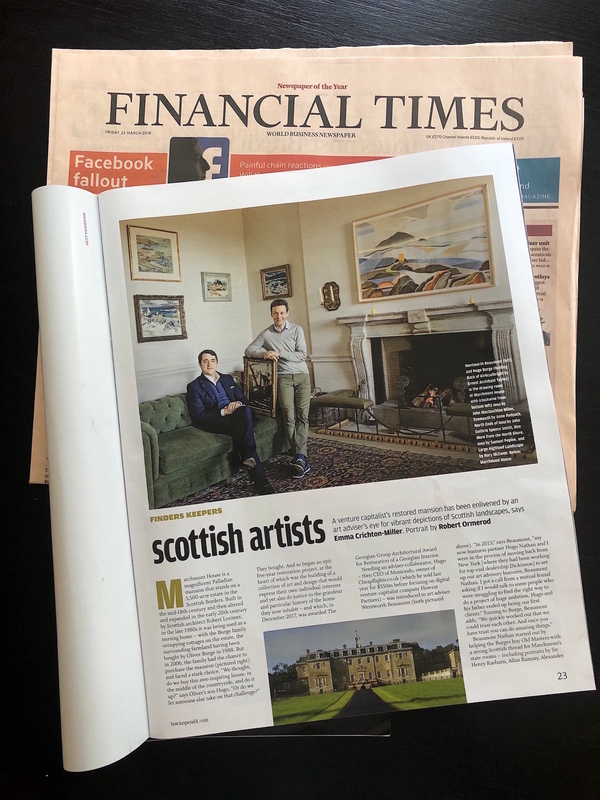 “‘‘If you are looking for value, you may need the confidence to buy against the prevailing fashion,’’ says Hugo Nathan of Beaumont Nathan, a London-based art brokerage and advisory company, who advises his clients to collect what other people are ignoring. As an example, Nathan — who adds that you should always go for the top- quality pieces in whatever field you choose — points to the early works of Edouard Vuillard, which can be bought for between $100,000 and $150,000, or works by the Northern Romantic School (artists like the Norwegian Johan Christian Dahl), which fetch around $20,000 to $80,000. He’s also particularly keen on Renaissance bronze portrait medallions, which tend to sell for between $1,000 and $10,000. (To put these prices in perspective, Jeff Koons’s top auction price is $58 million, and Gerhard Richter’s is $46 million.) ‘‘Some prices seem to have ballooned to a disproportionate level in the contemporary art market,’’ Nathan says.